Jim Greer, the former head of the Florida Republican Party, recently claimed that a law shortening the early voting period in the state was deliberately designed to suppress voting among groups that tend to support Democratic candidates, the Palm Beach Post reports. “The Republican Party, the strategists, the consultants, they firmly believe that early voting is bad for Republican Party candidates,” Greer told the Post. “It’s done for one reason and one reason only...‘We’ve got to cut down on early voting because early voting is not good for us.’"
The HB 1355 law, which was passed by Florida's Republican legislature and signed by Gov. Rick Scott (R) in Nov. 2011, cut the number of early voting days from 14 to eight. It was publicly sold as an effort to reduce voter fraud and to save money, but Greer says that this was simply a "marketing ploy." Greer served as Florida's GOP chairman from 2006 until 2010 when he was forced to resign after allegedly stealing money from the party. He was arrested and his case is pending. Scott's predecessor, Republican-turned-Independent Charlie Crist, resisted efforts from Republicans to shorten the state's early voting period, citing reasons that mesh with Greer's claims. In an interview with The Huffington Post earlier this month, Crist said the new law is clearly aimed at curbing turnout among Democrats. "The only thing that makes any sense as to why this is happening and being done is voter suppression," he said. Crist added, "People have fought and died for our right to vote, and unfortunately our legislature and this governor have decided they want to make early voting less available to Floridians rather than more available ... It's hard for me as an American to comprehend why you don't make democracy as easy as possible to exercise for the people of our state. It's frankly unconscionable." Greer also acknowledged that the effort to restrict early voting would directly affect turnout among Florida's African Americans, a demographic that consistently supports Democrats. “The sad thing about that is yes, there is prejudice and racism in the party but the real prevailing thought is that they don’t think minorities will ever vote Republican,” he told the Post. Greer went on to suggest that there was "absolutely nothing" state Republicans wouldn't do in following their "absolute obsession with retaining power." The court's ruling, however, only affected five of Florida's 67 counties -- those covered by the section of the Voting Rights Act cited by the court in its ruling. The vast majority of Florida voters were subject to the shortened voting period. 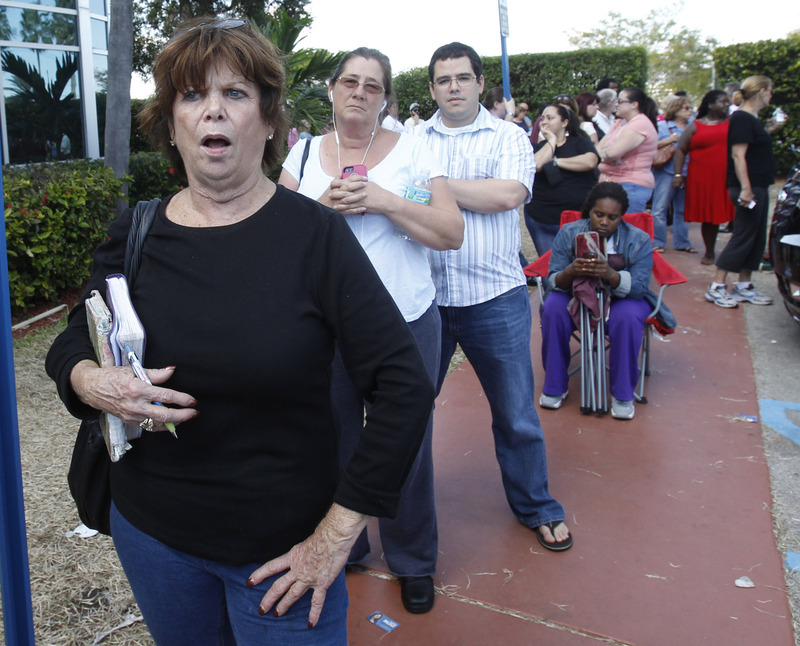 Despite lines as long as nine hours on Election Day in Florida, Scott said he stands by the new law. "Well I'm very comfortable that the right thing happened," he told WKMG Orlando after the election. He later promised to order a review of electoral issues.